Soul Friends, I would love for you to enjoy this 7-Day Devotional for FREE this December. 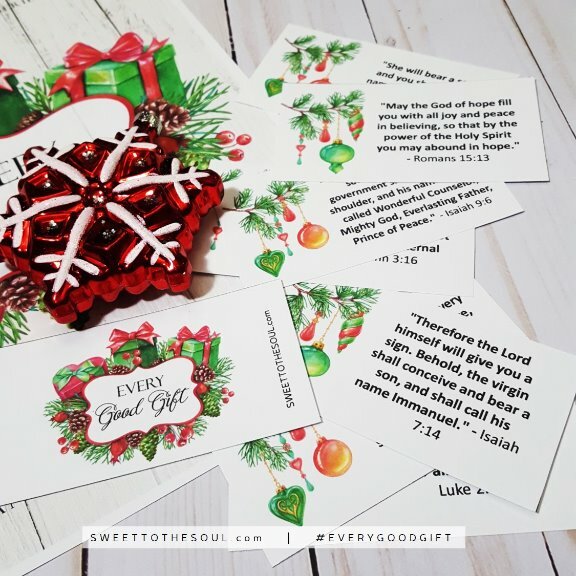 ​To download your printable devotional, scripture cards and journaling elements, just follow the link below and add your email address and Every Good Gift will be delivered directly to your inbox. 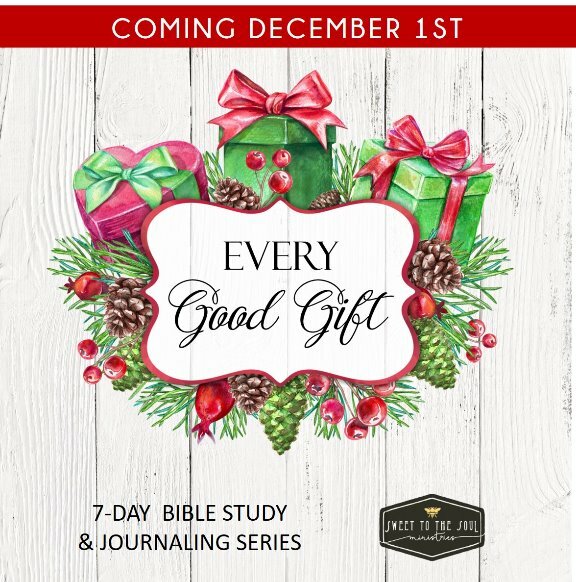 ​Every Good Gift is a printable 7-day Devotional and Journal which focuses on the best gift of all - Jesus our Lord and Savior. ​Included for each day is a devotional, a study journal page and a blank journal page. 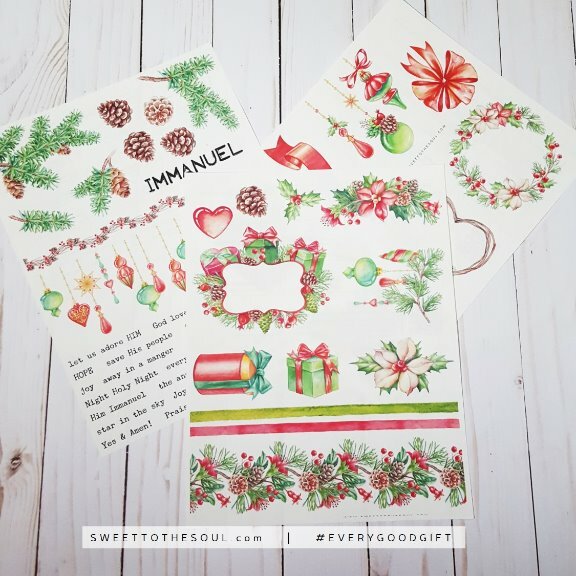 ​Also included are scripture memory cards and Bible journaling elements and phrases. After you receive your welcome email, you will want to click on the link in the email and download Every Good Gift to your computer. The Cover page, Scripture Cards and Scripture List I printed in color and on card stock. This heavier weight paper will hold up great with these pages which get handled a lot. It also gives a nice weight to the Scripture List if you want to display for your family to meditate on during December. The three pages of beautiful journaling elements, I print in full color on clear sticker (label) paper. 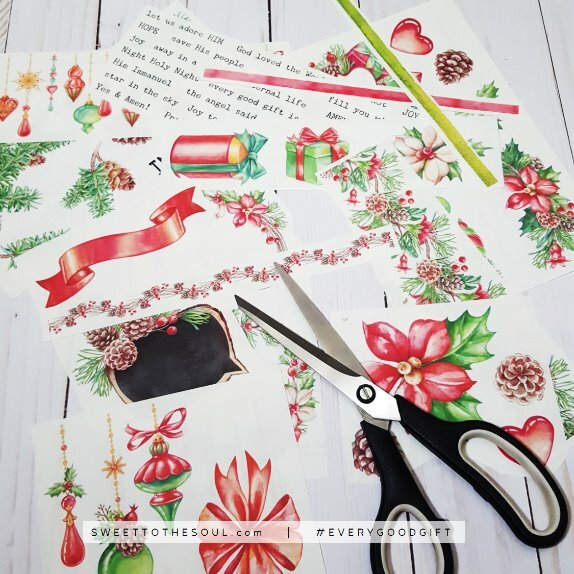 I love using them this way because I can just cut them out and adhere them to my Bible page without the need of glues or adhesives. Using the clear labels allows the text from the page to show through a bit. They can also be printed on a full sheet white label (sticker) page. The works the same as the clear labels but the white blocks out any text behind the sticker. ​I like to use these elements on blank cards or notes to gift to a friend for encouragement. The devotional, study and journaling pages I printed in black and white to conserve a little ink on my home printer. I printed these on just regular copy / printer paper. I also printed the devotional and study page in duplex mode ( front and back of the paper ). After everything was printed, I grabbed my scissors and began to cut apart all of the pieces to get them ready to go into my Bible. You'll want to cut out each individual Scripture card. I'm not sure how I will be using these during the month, I thought about adding them to a ring to attach to my Bible cover which would keep them handy when I am studying my Bible. ​But I think I am going to display them in my house so everyone visiting this month can enjoy them also - and ask me about our study so I can tell them about Jesus. ​They would also make great handouts to pass around as I am out and about. I may print an extra copy and tuck them in a card for some friends. Next, I loosely cut out the Journaling elements. I will fussy cut around them as I get ready to use each one. There are sure more here than I will be able to add to my Bible. I see some of these beauties going on some note cards for a friend or two. 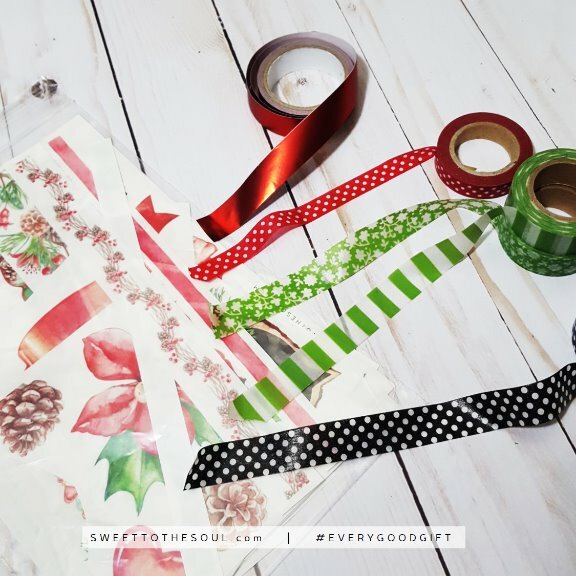 Lastly, I hit my washi stash to find the perfect reds and greens to accent these festive elements. And of course, I have to include a black washi - they are my fav! ​Look around your journaling or crafting stash and see what else you have to coordinate. Maybe some letter stamps and red, green or black ink pads. Or letter and word stickers. I can't wait to dive in! How about you? 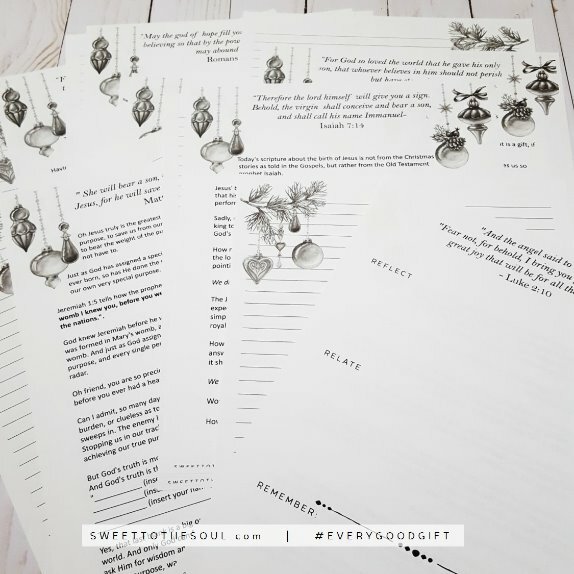 If you would like to see how I use my Every Good Gift Devotional and Journaling Elements, be sure and follow along on social media (links below), and look for the hashtag #EveryGoodGift. 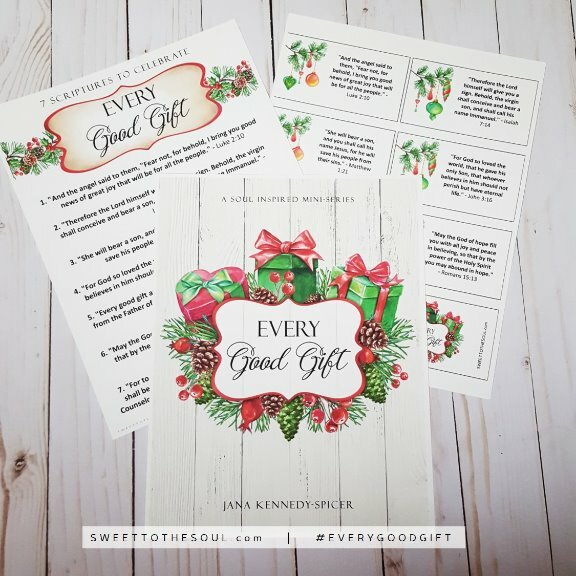 ​I would love to see how you use your Every Good Gift study. Add you pictures to social media also and be sure and tag me and use the same hashtag #EveryGoodGift. it took awhile for the devotional file to download for me but it did eventually. you might try again. Love this! Thank you for allowing us to enjoy this at no cost!! :) Blessings!